Tacky Sweaters, Animal Exploitation, and Holiday Humor! What tacky gift-giving guide would be complete without them? And thanks to eagle-eye reader Kolytyi, we have some tacky animal-themed holiday sweaters to share! Both of these were found at Amazon.com. I’ve linked the photos to the Amazon page. Last I saw, they’re out of stock…. thank Dog! Really? You had to go there for Christmas? Uh….. I sure hope this is for children! Have YOU found any tacky animal themed gift ideas this year? We’ve got two shopping weekends left before Christmas, so send those gift ideas to me at rumpysanta at gmail dot com, and I’ll share them with everyone! woo woo woo! I could see you in that sweater, Easy! woo woo woo! I don’t think number 3 counts. It’s not really about animals per se. Rather it’s intended to insult humans by using the word animal as a pejorative. You’re gonna hate me, but I kind of like it. It’s got that merry Christmas to all… and to all – shut the *$$* up feel. My inner Scrooge can appreciate it. We can agree to disagree on that one. If it’s about people, why does it use us animals to disrespect them? I agree that the term “animal” when applied to people is disrespectful of animals. But when you say to someone, “this house is a pig sty,” or “a chimp could do your job,” although you are indeed disrespecting those animals, the point is to insult humans. Good grief! These should for sure win an ugly sweater contest! Those first two sweaters are so weird…..hangover reindeer?! OMD….I feel sorry for the reindeer…. Well…..of course, it’s good for children though…. 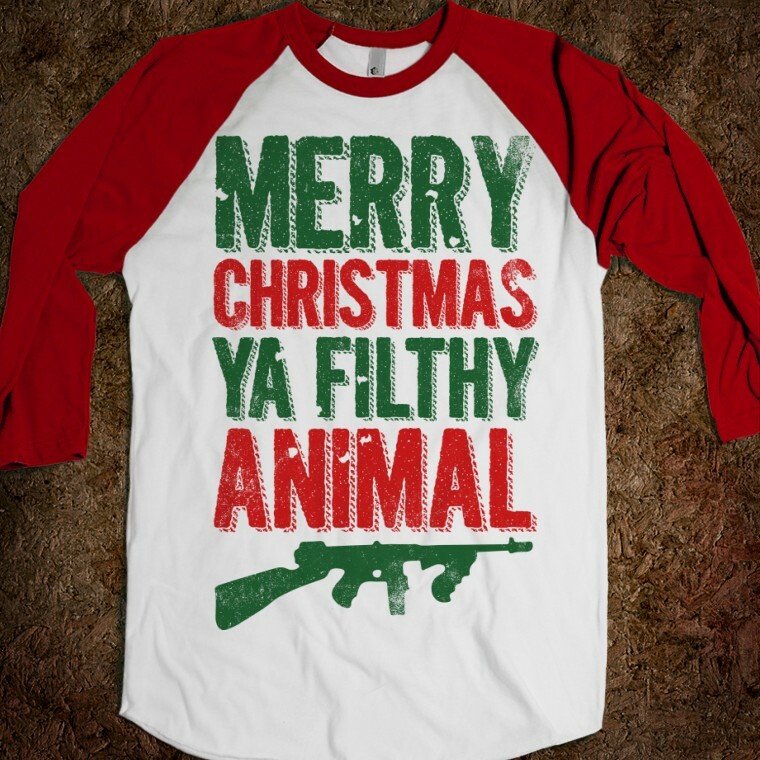 Merry Christmas and a rifle! I can’t find anything involving guns amusing. WE have SnowFreak Sweaters… do THOSE count??? I’m sure you’re able to pull off that look guys! Thanks goodness no one has actually gifted me with one of this monstrosities. Yoicks. P.S. I like your new template. Very clean and airy. Easier to read. I’m not sure if anyone else noticed, but the third one was actually a movie quote, it was used in ‘Home Alone’ at least three times! While I don’t quite agree with the message, I can appreciate the movie reference, and that is what made me chuckle. Rumpy, you have a great sense of humor (dogs usually do). I was wondering, have you thought about creating a line of sweaters for dogs that feature humans in an unflattering light? Kind of like a reverse of those dog shaming photos? I know you’re probably really busy this time of year, but that could be a cash cow–if you know how to knit or sew. Why would anyone want those clothes? Yuck. …I got my mother-in-law a sweater for christmas. Now I’m angsting that it’s actually super ugly. Oh well! BOL! I hate to be the scrooge in the bunch but here we go….I have always, all my life, even as a child hated holiday clothing. Not just Christmas clothing, sweaters most especially but all holidays.